Cloven hoofed and horned, Pan is the pagan god of nature. Half man, half goat; he is the sound of the wind in the trees and he is the smell of the earth. Dripping with black sludge and ritualistic doom riffs are Obelyskkh, a German doom metal band. All heavy, all crushing; they make a monolithic sound that carves cyclopean slabs of stone and erects them as temples to the nature god, Pan. Obelyskkh play their take on Neurosis' earthy post metalist doom and crust like they are a hoard of be-woaden pagan warriors standing proud and fierce against an onslaught of Roman legions sweeping across and swallowing up their land mercilessly. The opening and title track "Hymn to Pan" sets the tone with the gentle sounds of a spring morning. Birds are singing and the sun is warm while the golden silence is broken by the blowing of a pagan battle horn that drifts across a hazy valley. There comes then a solemn parade of mystical sounds that lures out of the earth a sudden heaving of heavy riffs that catches you instantly into head nodding worship. A pause arrives after a time with foggy atmospherics and earthy psychedelia and a chanted ode to Pan that brings back the gargantuan doom metal riffs in waves of flesh flaying pleasure. For the most part the tone is somewhat humbly solemn but "Hymn to Pan" evolves into determined and celebratory sludge/post metal that ends in a triumph of feedback and thus begins Obelyskkh's hymn to Pan. "The Ravens" follows with a sinister and foreboding doom riff that rattles under rolling drums with vocals that tell of the awesome and terrifying sight of seeing a flock of ravens that pass you by. The track revolves and unfolds into anthemic rousings that seem to ever ascend until a pinnacle is reached and the song collapses into sorrowful and ponderous piano. Next is "The Man Within" that opens with a vocal sample that kicks off a rolling torrent of sludge that soon falls into Neurosis like introspection and a gradual building of sludge metal tension. The track then snaps into huge slabs of black riffs that turn demented and worryingly scary towards the end so the squelchy feedback that the track falls into at the end is somewhat oddly comforting. The squelchy, electronic acid feedback seeps into the intro for "Heaven's Architrave" but then falls into a droning ambiance that serves as a calm before the storm moment of stillness. Soft guitar wafts build a different tension to the last track, where that one was black this one is tragically full of sorrow. When the huge sludgy riffs fall I am crushed not only by the low end riffs but also by the lamentous tone that is delivered hymn-like and which seem to strike a chord deep within. The final section has the track turn savagely into rolling and tumbling sludge metal that keeps tumbling and rolling until the abrupt ending into silence. "Horse" has some strange and unknown sound and a teasing voice that challenges warriors to "come out and play". Soon enough a huge sludge metal beast is unleashed which runs rampageous and violent with a dark, repetitive riff that morphs into a more triumphant and uplifting riff accompanied by guitar licks that take the song into some pleasing doom metal celebration. Finally there is the last hymn to Pan that is called "Revelation: The Will To Nothingness" and a famous vocal sample from the Joker in The Dark Knight movie introduces this one. This is followed by massive sludge riffs once again but with a vocal sample from master occultist and Pan lover Aleister Crowley reading one of his own poems. The sludge is thickened up with a harsh and gravelly vocal and a hectic pace reminiscent of EYEHATEGOD until the pace drops quickly to drive the sludge deeper into your brain. The sludge subsides to leave an airy, psychedelic breeze of drifting, atmospheric mysticism which serves as a moment of meditation in which to prepare for the inevitable onslaught of doom and sludge metal. A riff creeps in before the ever monolithic sounds of Obelyskkh finally fall to unleash the sludge beast once again to leave none untainted in its wake. The song stomps along unhindered while a slaying guitar lick plucks the heart strings in a return to the solemnity that seems rote through much of Obelyskkh's work. The pace gradually quickens with ever more destructive riffs that build the track to a seething doom and freaked out sound effects that break the track down into psychedelic ruin. The Joker returns again at the end to drive the point home only for an insane gabble of sounds that twists your mind into something thoroughly sludge drenched and doomed. Listen out for the hidden piano track at the end which nearly had me in pathetic fits of weeping. 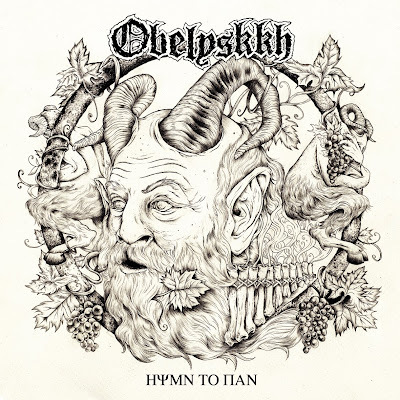 "Hymn To Pan" could very well be album of the year for me and I'm buying an Obelyskkh T-shirt forthwith.